Quick answer: Browse the accessibility-ready themes in the WordPress repository. But read on for some background on the accessibility-ready theme tag and finding accessible themes outside the WordPre repository. Great strides in accessibility within WordPress have been made over the last few years by the Make WordPress Accessible Team. Much of the work has been focused on improving the accessibility of the WordPress admin screens that site owners need to use to maintain their websites. But also, the accessibility of WordPress sites for site visitors has received attention too. This is obviously dependent on the accessibility of the theme chosen for the site – along with any plugins used and how the content authors have written the content for the site. Back in 2013, an extra accessibility review was added to the WordPress theme review process. This extra review was optional, but themes that passed the review could carry the accessibility-ready tag. Before this, many themes claimed to be accessible, but there was no way of checking whether that was actually the case, and some of these themes didn’t have a good level of accessibility. Initially, uptake was slow, but during 2015 many new or updated WordPress themes successfully passed the review and now carry the accessibility-ready tag. Why accessibility-ready, not just accessible? It’s important to realise that using a theme that has a good level of accessibility does not actually guarantee that a website built with it will be fully accessible. As I mentioned above, there is a risk that using plugins on a site can compromise accessibility – sometimes significantly. Also, content authors can inadvertently affect the accessibility of a site by the use of incorrect or non-semantic elements in the content, or by failing to ensure that meaningful link text is used, and that images have appropriate alternate text. Within the WordPress theme repository it’s possible to search on features, and the accessibility-ready themes can be found in this way. If you choose the ‘Feature Filter’ from the main Theme Directory page you’ll find the various checkboxes which can be used to select the features you require. The screen looks like this, and I’ve highlighted the accessibility-ready option. Once you select the ‘Apply Filters’ button the page refreshes to show all the themes that carry the accessibility ready tag. If you are not interested in any of the other feature filters, you can go straight to the list of accessibility-ready themes. What about themes not in the WordPress repository? WordPress themes are available from many different sources – not just the official Theme Repository. What about the accessibility of those? Themes are available from commercial theme companies, including some listed via WordPress itself – see Commercially Supported GPL Themes. A random investigation through some of these yielded no mention of accessibility in the theme descriptions. That’s not to say that these themes are all bad from an accessibility standpoint, it’s just that they haven’t been specifically reviewed for accessibility so no guarantees can be given. I do however know that a lot of work has been done to make the Genesis theme framework from StudioPress accessible, although they make no mention of that on their website. Bespoke WordPress themes can be built from scratch by developers – an example being the theme we use on the Coolfields Consulting site, and the ones we’ve built for clients over the years. It’s perfectly possible to build an accessibility-ready theme as long as developers follow the necessary accessibility guidelines. The WordPress theme review guidelines can help here with the required and recommended techniques. If a developer is going to build a WordPress theme for you or your business, it’s a good idea to ask them about their accessibility knowledge, and whether they follow the theme accessibility guidelines. If you have any queries about accessible WordPress themes or just accessibility in general, please get in touch. You can comment on this blog post, or use our Contact form. I’ll get back to you as soon as I can. In summer 2012 I presented to WordCamp UK about WordPress and Web Accessibility and flagged many accessibility deficiencies in the admin screens. 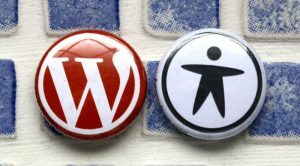 But what has actually happened since then, and what changes are in the upcoming release of WordPress 3.5?